If only I get a dollar everytime a person asked me "can I lose weight with yoga? I would be totally rich, especially now with the Rupiah currency that is really bad. My short answer to that question is yes you could if you practice regularly, and my long answer is this post. Enjoy! How does yoga help me lose weight? Just like any other type of exercise, yoga moves your body, and burn calories, especially the strong, dynamic styles of yoga; such as power yoga, vinyasa, or ashtanga yoga. It’s not rocket science, the more calories you burn compare to the calories you take, et voila, you lose weight. However, the dynamic types of yoga might not be suitable for everyone, especially if the person is severely overweight, or obese. They might feel overwhelmed, embarrassed, or self-conscious coming to power yoga class, huffing and puffing next to the lithe yogis sliding gracefully through vinyasa. Also, the dynamic style of yoga with lots of arm balances, inversions, and jumping forward – and back, might not be safe for the joints too. 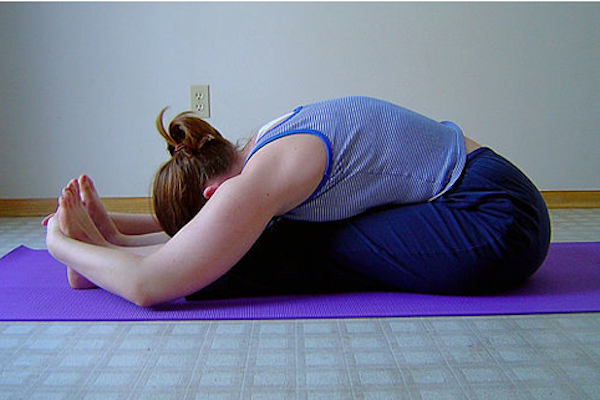 Slower type, such as hatha yoga, is much more suitable for an obese person. Yoga is a safe way for someone who is inactive to start moving his or her body again. Yoga practiced viewed as an exercise, also releases endorphin, a happy hormone, that counter stress. Chronic stress has been linked to weight gain, full explanation below. What does stress has to do with body weight? I heard you saying/thinking. Well, quite a lot actually. Ever heard of stress eating? Some people eat when they stress, they find their comfort in food. Yoga has been proven to reduce stress level; therefore, the frequency of stress eating will also lessen. When you are stress, it affects the whole body system, the fight or flight response is a fast acting response to stress, your body releases hormones adrenaline, and noradrenaline. This hormone increases blood sugar level, gets your heart rate up, and increases your breathing rate; practically preparing the body to fight of the stress. However, this hormone is designed for a short term only, when the stress continues, our body releases the next hormone, cortisol. This hormone releases fatty acids into the blood, and if the fat doesn’t get used up into energy, it will be stored into the body; usually around the abdominal area. If this cycle continues to happen, your weight will surely go up with chronic stress. In summary, managing your stress level can potentially reduce your waistline, and your weight. Even the gentle hatha yoga can reduce your weight, of course it will take time compared to conventional methods, but the result will last longer. In the yoga class, you might hear your teacher says over and over again breathe, breathe, and breatheeeee….! It’s not like we’re teaching you how to breathe, but to be mindful of the breathing, sometimes, in harder asana we unconsciously hold our breath. We can apply the same technique outside the studio, or we might already have, but you might not notice it. We chew our food slower than usual, we eat without checking our phone, and hopefully we become more conscious of the food we choose to eat. Mindful eating is the opposite of mindless eating (that often lead to weight gain); such as eating in front of the TV, or computer, and you wonder how on earth you finished those bag of potato chips. Proper yoga environment should exude positivity, and friendliness. Yoga is non competitive, and the practice can be different from one person to another. In the class, you should not compare yourself to other, as everybody is different. Body comes in all shapes and sizes, a good studio and teacher should be able to provide alternative to challenging poses. Yoga also teaches you to love yourself, yoga teacher often says that in the class, and it might ingrained in the brain, and get carried out outside the studio after the session finishes. If you have learned to love and accept yourself, the negative self-talk will dissipate, and your self-esteem will increase. When your self esteem increase, the lifestyle and diet changes will come from a place of wanting to take care of the body, and having a healthier body; instead of hating the body and wanting to lose a number of Kg. Amanda Soedharma has been a dedicated yoga practitioner for almost 10 years, and has been sharing the practice with others for the last 4 years. She graduated from Victorian Institute of Yoga Education and Teacher Training (VIYETT) advance diploma course in 2008. Amanda's style of yoga is strongly influenced by Hatha and Ashtanga Vinyasa Yoga which introduced her to the flow of asana. She taught yoga yoga classes in various studios and gym in Melbourne Australia and trained teacher trainees at VIYETT. As a qualified nutritionist and yoga teacher, her special interest is nutritional medicine, yoga anatomy and yoga therapy. Amanda has recently completed a 200-hour yoga therapy course and attended various workshops to continuosly expand her knowledge in yoga.